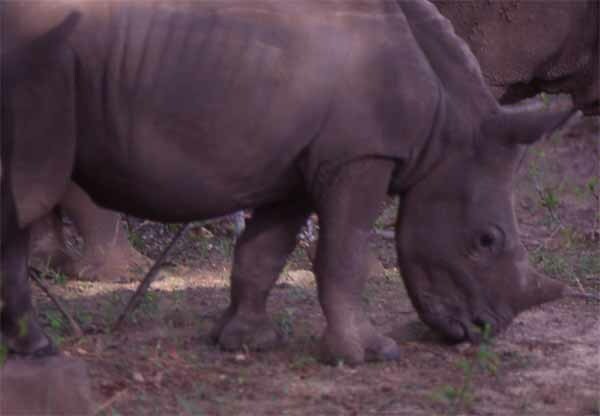 Rhinos are another of Africa's animals that fall into the "instantly recognizable" class. A huge, primordial-looking beast, the rhino is second in size only to the elephant among all land animals. The name means 'nose-horn', from the most obvious unique feature. But the protuberance is not true horn, and is in fact made of fused hair. The precise function of the horn is not known to this day, but it is certainly the main cause of the demise of the rhino. In the last 50 years, both species have been pushed to the brink of extinction by hunters who can get thousands of dollars for a single horn. 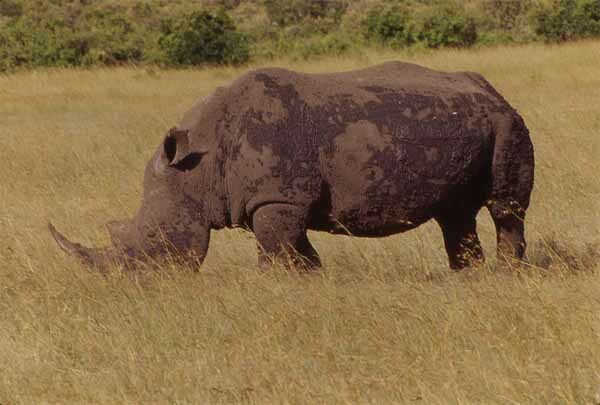 I photographed this white rhino in the Amboseli National Park in Kenya in 1996. Rhinos love to wallow in mud to cool down and to reduce skin parasites. That's what you can see on its skin. Six individuals had been given to Kenya by South Africa, in an attempt to reintroduce the species back into Kenya. Despite the attention of six armed guards (one for each animal), within a few months all six rhinos and their guards were dead, killed by poachers. This calf was happily roaming at the feet of the surrounding herd, six or seven adults in the Victoria Falls National Park, Zambia. The adults have their horns removed and are well-guardedthe combination of both approaches seems to have successfully deterred poachers up to now.